Welcome to (Best of) Sicily! Thank you for visiting the world's favourite Sicilian website, published in Sicily since 1999. We don't seek celebrity. This site is about Sicily, not about us. This publication is not the result of offshoring or outsourcing. Best of Sicily is edited in Sicily by Sicilians, while many Sicily-oriented sites are published and edited by people outside Sicily, in places like London and Milan. And no, this site is not published by a foreign (non-Italian) media firm which employs one or two outsourced "on-site representatives" in Sicily, or by an Italian expatriate living in the US or the UK. It certainly isn't the result of content farm output – writers paid an hourly wage to "mine" content from the web, travel books and other sources, then compose a few paragraphs of text about a place they've never visited. Best of Sicily is the (increasingly-rare) real deal – an independent ("free press") destination guide full of original articles, graphics and photos produced by Sicilian talent. If some of our material looks familiar, that's because this is the most frequently imitated publication about Sicily. Hundreds of sites re-publish our material without permission. Even where text is not plagiarized word-for-word, much information found on competing travel guides first appeared on Best of Sicily, and a few writers have even imitated our errors! 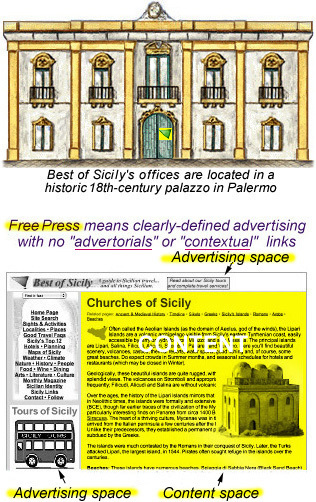 Writers for hotel chains, newspapers and other publications have lifted text verbatim from Best of Sicily. This site averages seven thousand unique visits per day from readers around the world. It is Sicily's most popular international publication. No other website or paper periodical dealing exclusively with Sicily in the English language has nearly this many readers. And an astounding 22 percent are returning visitors, a fact that indicates a high level of reader loyalty. Being here in Sicily means we have a better, closer knowledge of day-to-day events, so that we can provide you with insightful, practical, accurate information instead of the same generic "travel-speak" proffered by competing online travel guides. At the same time, our efforts support the local economy. From the beginning, Best of Sicily has facilitated several approaches to searching the site for the information you want. The Sights and Activities page is an index with links to pages dedicated to specific things to see and do: archaeological sites, medieval structures, museums, nature reserves, golf courses, beaches, children's activities and more. The Localities page makes it easy to find major cities, towns and places of interest to visitors. The scenery and landscapes of Sicily are described on the Scenic Regions page, with links to pages on topics such as mountains, coastal areas, beaches, the wine region and country life. On the History page you'll find links to all kinds of historical and social topics: a timeline, biographies, ethnology, genealogy and genetics, and our renown Peoples of Sicily series. And, of course, there are other "gateway" pages dedicated to trip planning, food and wine and other topics, such as Sicilian culture. 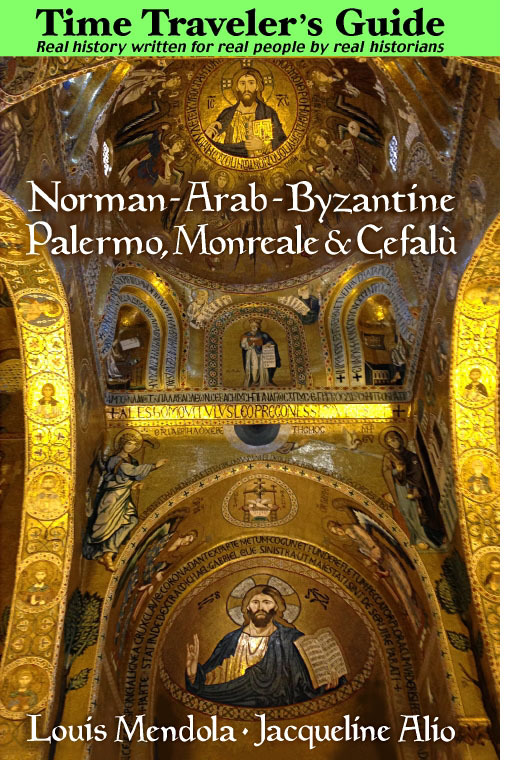 Best of Sicily also publishes See Palermo, a destination guide to Palermo and northwestern Sicily. Sicily for Students is a study resource - a subject index for students aged at least 13, with a guide for teachers and parents, where this site's PICS and SafeSurf ratings are explained. Most of our travel articles are written in the narrative style popularized by travel guide books. This contrasts sharply with the "fluffy," flowery, overly-imaginative "travel writing" typical of travel and "lifestyle" magazines (and some websites). That's because we're more interested in your experience than that of an itinerant, self-centered travel writer in search of a particular "mood" or impression – and his compensation based on a piece's word count and creative "angle." With all due respect for talented writers of any kind, we believe that Sicily is fascinating enough without the quasi-literary embellishments. By perusing the site for just a few minutes you'll see that we don't deal exclusively with "travel topics." That's because, as a destination guide, we're concerned with all things Sicilian, and that's a lot of things – including the things that make any place "real" and alive, and not just a museum. We don't like to talk about ourselves; it's not what we're here for. Publishing such a highly visible site is a responsibility we take very seriously. We're non-partisan but as a point of reference for Sicilians around the world we do acknowledge the existence of a Sicilian identity. We're unique but we're not alone. There are several good websites published in English dedicated to Sicilian travel or Sicily generally. The better ones (published in good, understandable English) are the work of Sicilian emigrés living in English-speaking countries. Best of Sicily is the work of Sicilians in Sicily – most of whom have lived abroad – and our office is located in a historic palace in Old Palermo. While today's technology can bridge distances, there's really no satisfactory substitute for being here in Sicily if you're writing for a Sicily destination guide! Best of Sicily is the most popular online travel and destination guide dedicated to Sicily, with over two million readers per year. (Like many other independent sites in the top 1 percent of internet readership, we arrived at this point thanks largely to the fair ranking systems of Google and Yahoo.) In an environment increasingly dominated by media conglomerates, mega-publishers and major travel-marketing brands, this site stands out as an example of a successful yet independent publication willing to challenge the "giants" of the field. As Best of Sicily is a commercial site, paid advertising is accepted (and we market our own tours of Sicily), but this is one of the few guides of its kind which is not published by a travel-services company (explicitly to promote hotels, tours, villa rentals) or a public tourism bureau. That means that Best of Sicily is "free press." It is an independent publication having an independent editorial policy. No bureaucrat, media mogul or business owner decides what we publish. You do. The content of this website is based on what readers want to know about Sicily, and that encompasses a great number of topics. Expressed another way: Yes, this site has advertising and commercial links, but Best of Sicily does not exist just to sell a product or service. That's not our raison d'être. Our pages are not advertorials and they don't contain so-called contextual links paid for by advertisers. Nor are there large, overbearing pictorial ads flashing and jumping off the screen, cluttering the pages you're trying to read. Where there is advertising it is clearly presented as such in the title or navigation areas outside a page's main text area or on a separate page, or linked from the links, travel services or travel ideas pages. While we occasionally (and without financial compensation) link to external sites of interest (and we have a commercial hotel reservation page), we don't publish a "travel guide" that presents advertising as if it were an essential feature of a topic, sneaking promotional, deceptive "contextual links" into every page in formats such as, "Read about (our) XXXX (service) for Sicily." We have actually refused paid advertorials for products and services (like long-distance cell phone service with a major European firm) specifically because we do not wish to place deceptive promotional content on this website. Think about that. It means that Best of Sicily is quite a bit different from a "destination guide" published specifically to persuade you to buy something from a vendor of Sicily tours, hotel lodging or villa holidays. It's also very different from the kind of "official" destination guide which exists to give you a ridiculously fantastic impression of a particular place in order to lure "tourists" (and their money) there. This site is about the real Sicily and real Sicilians. We will never insult your intelligence. On this site we only mention, and accept advertising from, legal providers of goods and services – real travel agents, licensed tour guides, restaurants rather than improvised food stands. Unfortunately, many services reviewed and promoted on travel-oriented websites are not legitimate. Compared to many sites of this kind, the information presented is highly accurate. That's because it is written by experts, in some cases published historians. In our Sicily important (or interesting) information is never concealed from visitors. On a practical level, that means no silly clichés and no platitudes. Whether we're presenting practical sightseeing advice or realistic information about travel safety, that's one thing that has always separated us from the herd of self-interested travel sites published by hotel chains, travel agencies and public travel bureaux. Their failure to present traveler safety information is a disservice to anybody coming to Sicily. On a more philosophical level – as regards historical topics – would you really want to read about modern Sicilian history (an important part of a Sicily destination guide) on a site where the editorial perspective was that Fascism, the Second World War and the Mafia "never existed" simply because the editors were too embarrassed to talk about them? That's not us. As Sicily's international point of reference, and the most widely-read Sicilian publication internationally, this site is consulted daily by travelers, students, culture vultures and also by researchers working for such publishers as the BBC, CNN and National Geographic, among others. Best of Sicily exists for the curious. If you're reading this, that includes you. Thanks for visiting.